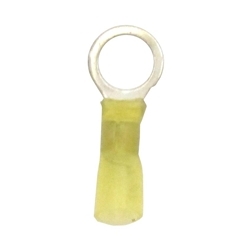 Terminal Ring 1/2" Heat Shrink Yellow Ring Not Brazed (12-10) TMR HTRY20 Bag of 25. Most commonly used style of terminal. Electro-tin plated copper terminal with a brass support sleeve. Ideal for cold weather and vibration resistance. Crimp on barrel of terminal and over brass sleeve.